Today, November 11, 2018, marks the 100th anniversary of the end of The First World War. The First World War–also known as World War I and the Great War–was a global war that originated in Europe and lasted from 28 July 1914 to 11 November 1918. It’s estimated that nine million combatants and seven million civilians died as a direct result of the war. Please take a little time today to pause and reflect. If you like to learn more about about WWI history, I would also highly recommend following The Great War Project blog. The Great War Project follows WWI as it unfolded and reads like a daily dispatch. Its archives are deep–follow the timeline through the dated links in the right sidebar. The Great War Project has a number of contributors and is hosted by journalist and blogger, Mike Shuster. Click here to read through our WWI archives on the SWLing Post. This entry was posted in News and tagged Armistice Day, Remembrance Day, The Great War, WWI on November 11, 2018 by Thomas. Who knows how many Americans realize that 100 years ago the United States was at war? After all, when about 25 people on the street in Beach Haven in the summer of 2012 were asked for a SandPaper article what war the U.S. had been involved in 200 years previously, very few could answer the War of 1812. There seems to be a flaw in the way history is taught in the U.S., and maybe math as well. It is easy to imagine that even a world war wouldn’t very much affect what was then a remote and rural Ocean County. But it did, in many ways. German U-boats prowled the Atlantic off the Jersey Shore; nearby Fort Dix (at first Camp Dix) was created and became one of the premier U.S. Army basic training centers in the country for decades. Nicholas Wood of the Ocean County Cultural Heritage Commission[…]discussed two aspects of Ocean County and WWI in his 75-minute lecture/slide show at the Long Beach Island Historical Museum on Monday evening. […]The second half of Wood’s presentation discussed the once-famous but now mostly forgotten Tuckerton Radio Tower, built in 1912 by the German government. Click here to read the full story at The Sandpiper. This entry was posted in Antennas, Broadcasters, News, Nostalgia, Radio History and tagged Richard Langley, The Sandpiper, Tuckerton New Jersey, Tuckerton Tower, WWI, WWI Radio on July 19, 2018 by Thomas. Many thanks to SWLing Post contributor, Mike, who shares the following from the YouTube channel The Great War. Thanks again, Mike! I’ll subscribe to The Great War channel on YouTube. If you enjoy reading about WWI history, I would also highly recommend following The Great War Project blog. The Great War Project follows WWI as it unfolded 100 years ago. It’s an absolute treasure trove of information and brilliantly written. This entry was posted in News, Nostalgia, Radio History and tagged Radio History, The Great War, Videos, WWI, WWI Radio on January 8, 2017 by Thomas. When America declared war on Germany in 1917, most radio stations came under government control, reserved for war efforts. 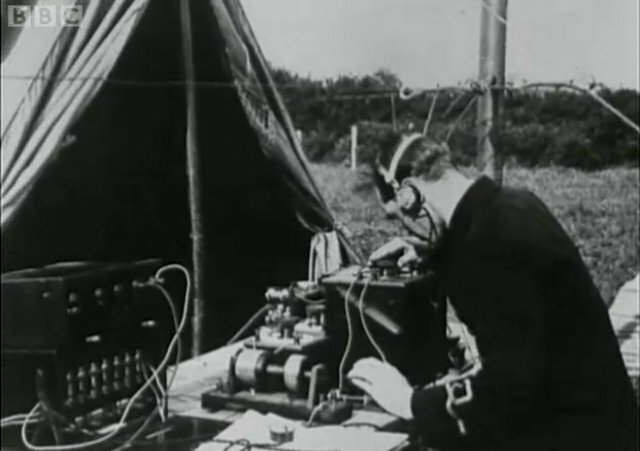 On this edition of Up To Date, we learn why HAM radio operators were prevented from broadcasting during The Great War. Jonathan Casey is the Edward Jones Research Center Manager at the National World War I Museum. Herb Fiddick is the amateur radio voice of the National World War I Museum. This weekend, the National WWI Museum will host special event station WW1USA. The station will be manned by amateur radio operators for 31 consecutive hours, beginning Saturday, December 12 at 10 a.m. through Sunday at 5 p.m. The event is free. For more information go to theworldwar.org. Click here to listen to the interview on KCUR. This entry was posted in Ham Radio, News, Radio History and tagged KCUR, WWI, WWI Radio on December 12, 2015 by Thomas.